Friends, welcome to the fourth edition of the Memorial Scrolls Trust Newsletter. I am pleased to confirm that we have now sent Scroll-­Trackers to every community and organization caring for our scrolls by our target date of 31st December. If you have not yet completed one please do so in order that we can correct our database. Our Czech Torah webpage project continues to progress and we have now made 196 reciprocal links. This is an important and exciting project so if you have not yet done so please add a Czech Torah page to your website and link it to our own site. We are now working on digitizing our 50 plus years of archives which is a mammoth operation and will continue throughout the year. received scrolls to add to the single one that has been in the country up till now. Please remember this Newsletter is yours and we rely on you to send us articles. I hope you enjoy this issue and please write with any comments and suggestions you may have. In 1978 two members of The Fair Lawn Jewish Center, Ed and Alix Davidson, obtained, on permanent loan for our congregation, a Holocaust Memorial Torah from Pacov. It had been taken to the Westminster Synagogue in London in 1964, along with over 1,500 other Torah Scrolls from Czechoslovakia. A special case was constructed in our main sanctuary, where the Torah is prominently displayed. In 2014, the 50th anniversary of the arrival of the Scrolls in London was celebrated. Each Jewish organization that had a scroll on permanent loan was asked to send a poster with a photo of the scroll to London for that anniversary celebration. Motivated by this milestone, I decided to do some research on the city of Pacov, working with the students of the Zayin, (7th grade) class in our Religious School. 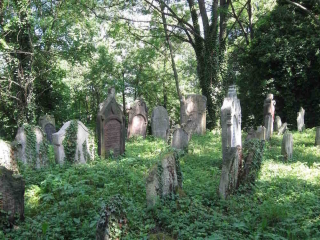 Google searches revealed that there are many photos of the synagogue as well as of the Jewish cemetery in Pacov. Further research, from the website of the United States Holocaust Memorial Museum in Washington D.C., revealed photos, home movies taken in Pacov in the 1930s and information about some of the Jewish residents of Pacov. The daughter of a survivor from that town, Gabi Rosberger, had donated them to the Museum. I have also been in touch with Karen Koblitz, a California resident whose family is originally from Pacov. She found out about my congregation’s Torah scroll from Pacov on the internet because it was the subject of an article in our local Jewish newspaper, the Jewish Standard. She was able to visit Pacov, and sent me photos of the synagogue building. She is currently working to see if it can be restored as a museum or cultural center for the town. She visited Pacov in the summer of 2016 and presented a copy of my booklet to the mayor of the town. Pacov, pronounced “Paztov” and sometimes written with its German name, Patzau, is a small town fifty miles southeast of Prague. Today its population is approximately 5,000, and no Jews live there. On the internet I found an article called, The History of the Jews of Pacov, written in Czech by Jan Zoubek, identified as an “archiver.” He was the manager of the municipal museum in Pacov and by profession a maker or seller of hats. I was able to have that article translated into English. You can read that it at http://www.jewishgen.org/yizkor/bohemia/boh472.html and that translation is also in the booklet I published. The History of the Jews of Pacov was a chapter in the 1934 book Die Juden und Judengemeinde Bohmens in Vergangenheit und Gegenwart, The Jews and Jewish Community of Bohemia in Past and Present by Hugo Gold. It was a companion work to Gold’s 1929 volume that contained the history of the Jews of Moravia. Each chapter in that book records the history of a different community. Most of the chapters are available on the internet. Some have been translated into English and are listed on the web site jewishgen.org. The History of the Jews of Pacov tells us that Jews lived and thrived in Pacov for some four hundred years. Mr. Zoubek, clearly wrote the article working from the official register of the town, also known as the cadaster. It is not a work of critical history, yet it preserves the memory of those Jews who lived in Pacov. He tells us about real estate transactions, the names of the Jewish families, their professions and the conflicts they had with other individuals and groups in Pacov. That gives us a sense of how the Jewish population of Pacov grew and what restrictions it faced as its numbers expanded. We read about legal disputes reflecting how different groups in the town saw their role in regulating Jewish economic life. Despite those periodic disputes he points out that Jews and non-Jews had good relations in Pacov. The community was never very large. It is difficult to know the exact Jewish population of Pacov and its surrounding villages. Zoubec’s History speaks of the highest Jewish population as 164 in 1920. Yet The Encylopedia Judaica of 1906 lists the Jewish population of Pacov and 29 surrounding villages as 509. It notes that the community had a synagogue, a cemetery, a religious school and a “Hebrah,” a chevra kaddisha, the group that took care of the burial and traditional rituals for the dead. One can assume that the peak Jewish population of Pacov occurred sometime in the mid to late nineteenth century. That was before the general migration in Europe from small towns to large cities as a result of industrialization and increased commerce that offered opportunities to the residents of those metropolises. The work of the Memorial Scrolls Trust has kept alive the memory of the Jews whose Torah scrolls are now memorials to the communities. I hope that other communities will find out more about the history of the town or city where their scroll came from so that the memory of those Jews will endure. York Liberal Jewish Community reports that a Shabbat morning service was held on Saturday 19 November 2016 in the presence of His Worship, The Lord Mayor, Councillor Dave Taylor and his partner Susan Ridley, the Lady Mayoress, as well as Mr Jonathan Tyler, Sheriff of York, and the Sheriff’s lady, Mrs Brenda Tyler. 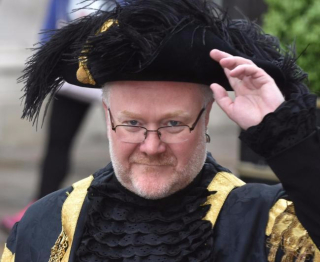 For Lord Mayor, Councillor Dave Taylor, it was a very interesting experience: “I’ve been to Prague and visited various Jewish cemeteries and memorials, but this was the first time I have attended a Jewish service of any kind. What really struck me about today was hearing the story about the Czech scrolls,” he said. The weekly reading from the five books of Moses, scribed in Hebrew by hand on a Jewish Torah scroll, was read from a Czech scroll which had been rescued from Holocaust in the aftermath of the Nazi persecution. Number 804 of nearly 1600 such scrolls, it has been loaned to the York community by the Memorial Scrolls Trust. Its full history was recounted at the service by Ben Rich, Chair of the York Liberal Jewish Community. A sermon I gave on Yom Kippur 1978 gave a new focus to my life and to that of my congregation – the Northwood & Pinner Liberal Synagogue. In that sermon I reminded the congregation that the Torah Scroll I had just read from was a “Czech Memorial Scroll” from the town of Kolín, one of the 1,564 scrolls from around Bohemia and Moravia that were taken from Prague and sent to the Westminster Synagogue in London in 1964, the year before our congregation was founded. In the decades since then Michael and I have made countless visits to Kolín, The early trips in Communist times were not easy, but they were full of excitement: I felt as if I was in a Cold War spy story and indeed eventually I was advised by the British authorities not to go back. We were lucky that two of the staff in the Kolín Town Museum had been directors at top Prague museums but lost their jobs and were relegated to this very minor museum after the Soviet-led invasion in 1968 that crushed the reformist “Prague Spring.” Their act of defiance was to research the Jewish history of Kolín – something of a taboo subject under Communism — and give us copies of valuable documents from the archives. 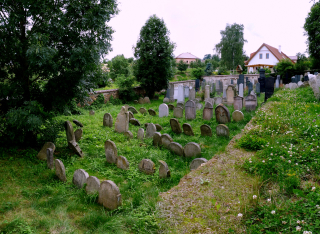 Jews first arrived in Kolín in the 14th century; the town’s old cemetery dates from the early 15th century and contains many important graves, including that of the son of the fabled 16th century Rabbi Judah ben Bezalel Löw, or Maharal. (There is also a New Jewish cemetery, which opened in 1888.) Kolín had an important yeshiva and a significant medieval ghetto; at one time the community was second in Bohemia only to Prague. In June 1942, some 480 Kolín Jews were deported, and very few survived: there is a memorial to them in the New Cemetery. The community’s rabbi, Dr. Richard Feder, was one of the few who did return. He briefly restarted the community, but in 1953 he moved to Brno and eventually became the chief and only rabbi of Bohemia and Moravia, dying in 1970. Kolín’s ornate baroque synagogue, dedicated in 1696, features an impressive Ark donated by the Austrian financier Samuel Oppenheimer. When we started our visits, the synagogue still stood, in the heart of the old Jewish quarter. It seemed in surprisingly good condition, but deserted and, at our first visit, used as a storage space for large, red, Communist propaganda banners. After the Velvet Revolution in 1989 I got involved in setting up the Reform community in Prague and was invited to lecture and take services in Plzeň, Brno and Olomouc. Then I was invited to lecture in Bratislava and eventually became their “liberal rabbi to the Orthodox community” and to travel all over Slovakia, visiting the many synagogues that stood in ruins or, of late, have been being restored. Throughout the years, time and time again, I’ve kept going back to Kolín. And I haven’t gone alone. We have brought large groups there on many occasions. In 1992 we came to Kolín to dedicate a plaque to the memory of the 480 Jews murdered in the Shoah. In 1996 we celebrated the 300th anniversary of the synagogue, and a member of our synagogue wrote a musical play, “Stones of Kolin,” which was performed in the town theatre. In 2002 and 2012 we marked the 60th and 70th anniversary of the deportations. In 2015 we commemorated the return to Kolín of the pitifully few Jews from Terezín by publishing an English translation of the account by Rabbi Feder, describing the fate of his community in the Shoah. Moreover, we take a group of teenagers to Kolín every year to ensure that at least one Jewish service is held annually in the synagogue. So — the sermon changed my life also changed that of my congregation. And over the years – over the decades by now — our interest has also inspired the citizens of Kolín to take on the challenge of keeping alive the memory of their lost Jewish community. They have restored the synagogue and it is used as a concert hall. They have installed in it a permanent exhibition telling the history of its Jewish community. They mount regular temporary exhibitions, for example, on the life of Rabbi Feder; or on the “lost Children of Kolín” researched and produced by students at local schools. And now they are cooperating with us in installing over 50 Stolpersteine in the centre of town, in front of houses from which Kolin’s Jews were deported. There will be booklets (obtainable in the town information office) telling the story of the former Jewish citizens marked by these brass plates. Our next visit to Kolín is set for Shavuot…30th April to 2nd May 2017. We who use the Kolín scroll still today in London will pray in the synagogue and meet with local people; we will dedicate the Stolpersteine trail. We will celebrate the achievements of the Jews of the town and, in a way, also celebrate the persisting connection with past and present that continues to make such an impact on all of our lives. 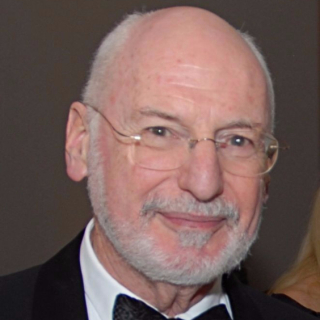 Rabbi Dr Andrew Goldstein is the Emeritus Rabbi of the Northwood & Pinner Liberal Synagogue. At a poignant ceremony on November 9, 2016 -- the anniversary of Kristallnacht -- Calvary Hospital dedicated MST Scroll No. 515 after a year-long restoration effort. This Torah scroll dates from 1880 and is originally from the town of Taus-Domazlice, in what is now known as The Czech Republics. Since 1988, it has been on permanent loan to Calvary. On hand for this historic and first-time Calvary event, were Jeffrey Ohrenstein, Executive Chairman/Trustee of the MST and Rabbi Levi Selwyn of Sofer On Site, the company who handled the restoration. “I am so delighted to be here for this joyous and meaningful event,” said Mr. Ohrenstein. “Calvary could have easily commissioned a brand new sefer Torah. Instead they chose to take the time, effort and considerably more expense to breathe new life into this historic scroll. Now, all Calvary patients, families and staff will be able to benefit from this effort. Calvary, a Catholic-affiliated hospital and home hospice, provides palliative and end-of-life care, including extensive support for families and friends of our patients. The Hospital cares for nearly 800 Jewish patients and families every year. Calvary creates a welcoming environment for all Jewish patients and families, wherever they are in their degree of religious observance. 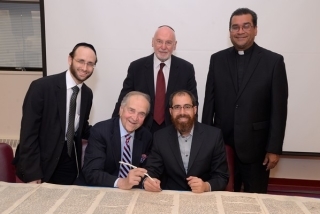 Thanks to early significant support from the Charles R. and Winifred R. Weber Foundation, Calvary launched the restoration in November 2015 at the 92nd Street Y, a prominent center of Jewish learning and culture in the heart of New York City. Over the year-long project, Calvary hosted three letter-writing events at their Bronx campus to give supporters the opportunity to write a ceremonial letter. From individuals and empty nesters to entire families, attendees at the three letter writing events have been able to share the background about the person for whom they made the gift. Many supporters from throughout the year-long project have told Calvary how meaningful this project has been to them. 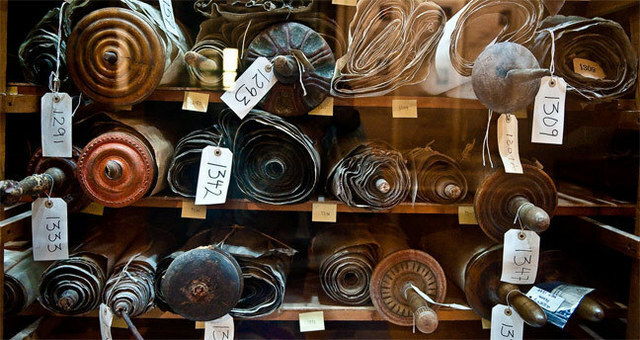 The vast majority of MST Torah scrolls have been loaned to recipients firmly planted in the Jewish community such as synagogues, camps, yeshivas, day schools and community centers. Calvary's scroll, No. 515, is one of only 20 in the greater New York area today and one of just a handful that have gone to non-Jewish recipients. Jewish patients and families at Calvary have many amenities at their fingertips. Three rabbis at Calvary care for inpatients and home hospice patients each year. In addition to kosher food upon request, Jewish inpatients and their families can expect a daily visit from a rabbi, food from an expanded Kosher Hospitality Room, dedicated Shabbos Lounge, Kabbalat Shabbat service, and celebrations of all major holidays. The Hospital’s outreach to the Jewish community, and the Torah restoration, has been spearheaded by Dr. Michael J. Brescia, Executive Medical Director.